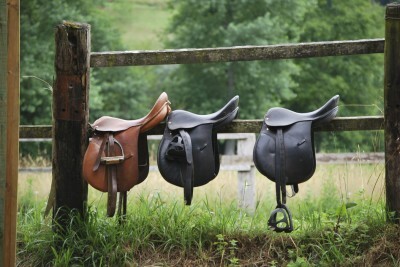 Whether you’re having issues with your horse, or your horse is having issues with you; it all starts with Horsemanship. Stop feeling puzzled. While it may sometimes feel like there’s no solution with your horse, know that we have the missing puzzle pieces to help you solve the problem and enjoy your horse the way you always intended. The picture looks better with all the pieces together. That’s right, you’re horse is amazing! Sometimes it takes the relationship building expertise of a seasoned horsemanship professional to help you create that missing connection between you and your horse so that the two of you can synchronize and function as a unit. Your horse needs you, but more importantly, your horse needs you to build an awesome relationship with it. Clear, Concise Personal Instruction assists you to build a strong foundation with your horse and yourself and gives you an exponential connection that is difficult to achieve from an equestrian book or video. While others may be quick to blame the horse and/or the rider, Kathe digs deep into the psyche of the horse and rider to help determine exactly where resolution needs to begin. Only until the core issues are recognized can they be dealt with. Once these core issues have been dealt with a rider and horse can truly work together cohesively to make amazing experiences for the both of them. It’s this fundamental difference that separates Kathe & Quiet Mind Horsemanship from the typical “backyard horse trainer”. Quiet Mind Horsemanship strives to teach Natural Communication allowing the horse/human combination to build confidence, overcome fears, and encourages mutual respect between the two. I started riding when I was 5 and graduated from the Pacific Horse Center Hunter Jumper Program in 1983. Since 1992, I have attended at least 3 to 5 Buck Brannaman clinics annually, and ride with Upper Level Dressage and Jumper Couches regularly. 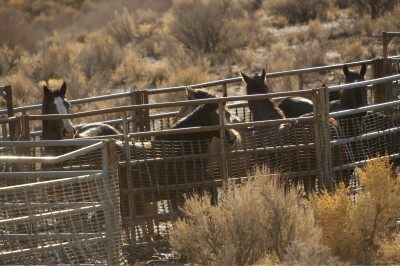 Continued education of the horse and human are of great importance to me. I strive for a higher level of education for myself, thus allowing me to pass this knowledge on to my students. I work with all disciplines in the horse industry. 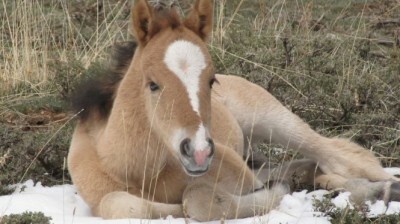 I start colts & mustangs, also restart horses with human and behavioral problems. I have worked diligently to learn about the Mustang and give the Mustang a good beginning or restart in the domestic world. The methods I have adapted starting and restarting horses allows them to learn easily, move forward comfortably, and excel rapidly with a Quiet Mind. The horses gain confidence, trust their riders, and are prepared for any level of riding be it competition or trail. For the human I offer Balanced Centered Riding skills explaining Feel with Timing while encouraging Communication and Awareness through a Balanced seat and body. One of my mottos is “Don’t Sell The Horse, Solve The Problem”. I believe that horses come into our lives for a reason and we can strive to help these horses have a better understanding of what the human is asking of them. There is a reason for each horse and human combination. I run 1, 2 or 3-day Horsemanship Clinics with up to 15 horses per class. Each day lasts approximately three to four hours and during this time, you will learn groundwork, address problems, have hands on demonstrations, and advance your riding skills to help you and your horse better understand each other. 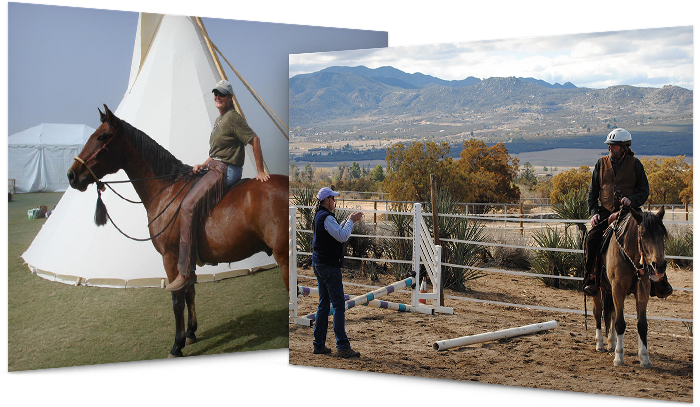 If you are interested in learning from Quiet Mind Horsemanship, please contact me, Kathe, directly at 951-763-2746/805-798-0234. Persons interested in being Clinic Sponsors, contact us to go over dates and details. “A horse comes into our life for a reason,” Kathe Smothers told me soon after meeting me and my troubled seven-year-old Morgan mare, Choteau. “They each have something to teach us.” In my case, the lesson was courage, and it was a lesson that both my horse and I needed to learn. I was a fifty-eight-year-old novice rider with a “hot” horse. (Choteau had been grossly mishandled by an insensitive owner/trainer for the first six years of her life.) Thanks to Kathe, I did not give up and try to find an “easier” horse. Today, Choteau and I are a team, and my lifelong dream of riding the trails on my very own horse has come true. Thanks, Kathe! As a brand new rider, I adopted Oskar, a neglected and troubled horse. It was a risky, if not foolish thing to do. But Kathe offered to train the both us, and I am thrilled to say that we are doing great. Kathe was the definitely the key to our success. What distiguishes Kathe as an instructor is her ability to perceive a rider wholistically and tailor her lessons accordingly. Depending on a student’s needs, she might give instruction on technical riding skills, or emotional support to develop self-confidence, or natural horsemanship theory to improve understanding. She does it all with humor and great kindness. Her group classes have a devoted following because of the supportive but challenging environment she creates for riders at all different skill levels. Kathe’s training has been a priceless gift to me. I had no idea how rewarding it could be to have a connection to a horse, and I am deeply grateful to Kathe for showing me the way.